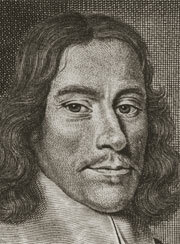 Dr Thomas Willis (1621-1675), natural philosopher, anatomist, physician, neurologist. 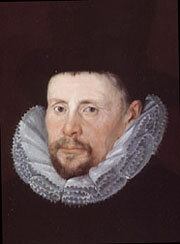 Sir Thomas Fleming (1544-1613), Chief Baron of the Exchequer and Lord Chief Justice. 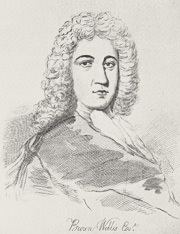 Browne Willis (1682-1760), antiquary, numismatist, and architectural patron. The Willis Fleming family of Stoneham & Bletchley was a dynastic English family of landed proprietors and 'great commoners', founded by Dr Thomas Willis (1621-1675), physician and natural philosopher. His grandson and heir was the antiquary Browne Willis (1682-1760). From 1766, the Willis family adopted the additional name and arms of the extinct Fleming family of Stoneham -- which had been founded by Sir Thomas Fleming (1544-1613), Lord Chief Justice. For centuries the Willis Fleming family was a prospering corporate entity -- a continuity of blood lineages and hereditary property -- that evolved with its own traditions and mythology. But in the present, its status is almost entirely historical; its estates have been sold and broken up, and its property, dispersed. In the family's heyday, the seat of North Stoneham Park lay at the heart of a great estate, with land in Hampshire and the Isle of Wight (some 15,000 acres in 1844), as well as Buckinghamshire and Cambridgeshire. The estates included some fine country houses: North Stoneham House, South Stoneham House, Water Hall, Whaddon Hall, Stetchworth Park, Binstead House, Chilworth Manor, Heasley Manor. Heads of the family, or their heirs, at different times also possessed estates in Herefordshire, Dorset, Suffolk, Lancashire, and Scotland. At the beginning of the twentieth century, the âFleming Estateâ still extended to some 12,000 acres in southern England. However, in 1939 the ancestral mansion at Stoneham Park was demolished, and by the 1950s the estates had been fragmented and mostly dispersed. Despite its historical significance, the heritage of the Willis Fleming family and estates have been largely neglected and forgotten. Information is often dispersed and inaccessible. Oral history has been lost as generation succeeds generation. Monuments have decayed, and have been damaged or destroyed. Only portions of the historic landscapes have survived modern road and housing development. There is a need to record, preserve, and remember this heritage. The Willis Fleming Historical Trust was formed to meet this need.